The beach of Los Lances hosts this weekend the fifth edition of the “Beach Polo Rate”. Four international teams will contest the tournament starting in the afternoon on Saturday. The sand of Los Lances and the coastal landscape make Tarifa an exceptional course for beach polo. They will be the best players associated with the Sotogrande polo season. And it is that from this international epicenter of the world pole every year Tarifa is regarded as the ideal place for practice on the sand. It is expected that the best polo will arrive in Tarifa this weekend. The fifth edition of the Beach Polo Tariff is held on September 15 and 16 at Los Lances beach. An already classic event that leads to the city identified with wind sports, all the excitement of the world of polo in two days of competition. In total, four international polo teams will participate in the fight to win the trophy of this fifth edition. The meetings, on the day of Saturday 15, will be played from 5:30 pm to 7:30 pm, approximately. From there, there will be parallel events at the OM Beach Club Chiringuito, close to the playing field. The semifinals and final will be played in the morning, on Sunday, from noon and until 2:00 p.m.
From that hour there will be awards and the environment chill out with music and gastronomy. The meeting is open to the enjoyment of all the interested public. 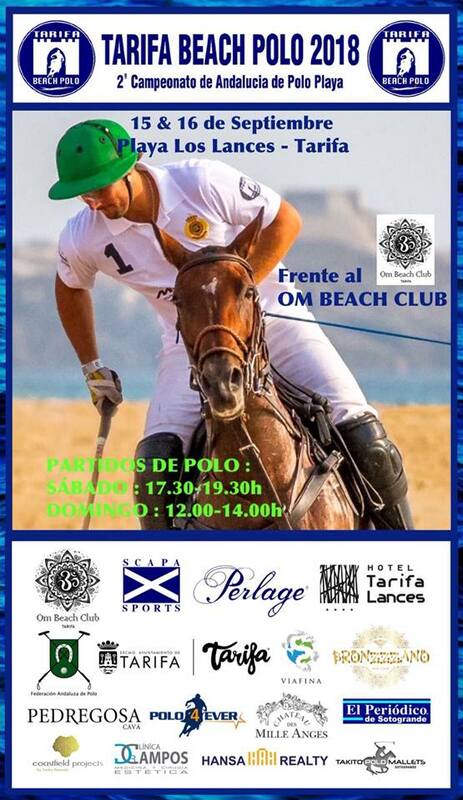 This new edition of the “Beach Polo Rate” has the collaboration of the Periodic of Sotogrande, OM Beach Club Tarifa, Hotel Tarifa Lances, Scapa Sports, the Andalusian Federation of Polo and the support of the City Council of Tarifa.